Collective protection is the preferred method for preventing falls when work has to be executed at height. With collective solutions all workers will be protected from fall hazards with a single solution. Roof parapets are an example of collective protection, if they are high enough. 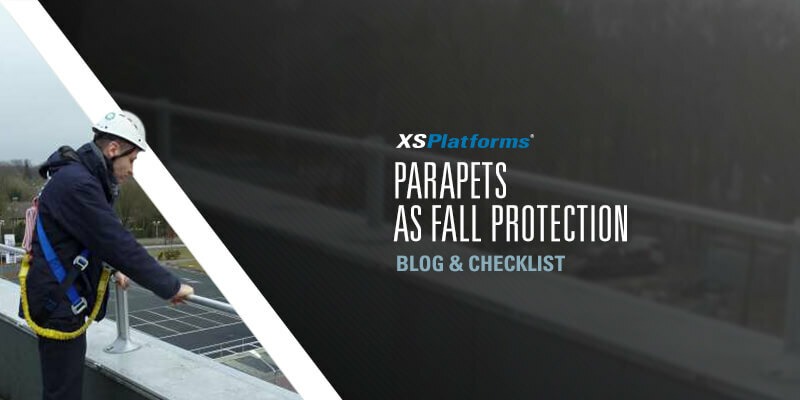 In this blog we’d like to explore when parapets are a suitable method for fall protection and when extra measures are needed. A roof parapet wall is a permanent part of the roof edge, extending above the roof surface. Parapets serve various purposes such as fire protection, modify wind flow, prevent objects from falling, hide equipment from sight and/or improve the aesthetics of the building. The height of the parapet, however, varies greatly. Some roofs have a parapet that is 15 cm high, which will do absolutely nothing to protect workers from falling over the edge. Other parapets are over a meter high, hiding rooftop equipment from view and providing safety to those who have to perform maintenance on the roof. Most countries have health and safety regulations that state a minimum height for parapet walls and guardrails to provide fall protection. Parapets must meet the same height requirements as guardrails to provide adequate protection. The parapet must have a height of 42 inches (1,1 meters), plus or minus 3 inches (8 cm), above the roof surface to serve as fall protection measure. The rules within the UK are similar to the USA, parapets must be 1,1 meters high, otherwise other fall protection measures must be taken. Parapets must be between 0,9 meters and 1,1 meters high measured from the roof surface. Parapets on existing buildings must be 1 meter high to provide protection from fall hazards. Newly constructed buildings need a parapet of 1,1 meter or higher to provide protection. Is your country not listed, but are you interested in learning more about the rules regarding parapets? Contact us for more information. To summarize, if the parapet exceeds a minimum height (check local regulations to see what height) the installation of additional fall protection is not necessary (if there are no unprotected edges). But what if the parapet is not high enough? When working on a roof where the parapet is not high enough, fall protection must be installed. As the first choice is always to provide collective protection against a possible fall risk, guardrails can be installed. This form of fall protection is common and is available in various types. From permanent to freestanding, from simple to more advanced. The choice of what type of roof edge protection is used depends on the wishes of the building owner, the user and / or the (main) contractor. Permanently installed guardrails are usually mounted on the inside or on top of the existing parapet. This solution is ideal for buildings where the parapet does not meet the nationally imposed requirement, and where the parapet can be raised to the right height with the guardrail. Because the guardrails are always present, little to no user knowledge is required. In practice we often see the installation of freestanding guardrails. This type of guardrail is held in place with counterweights. Advantages are that neither the roof nor the parapet needs to be penetrated for installation, and the guardrails can be removed easily. Additionally, there are freestanding guardrails available that can also be folded down and hidden from sight when not in use. These three arguments are why building owners often opt for this solution. Installers of fall protection also prefer solutions with a freestanding guardrail as they attain the highest degree of safety, while enjoying ease of installation. In combination with the lightweight nature of our guardrails this results in shorter installation time. A plus for both the installer and the customer. Interested in the possibilities that guardrails offer for your building or project? Download our free guardrail leaflet and read more about the advantages of our collective fall protection.